Gary Bornick and I threaded our 2008 Gold Wings along Washington State Highway 4 parallel to the Columbia River. We were close to where the river’s fresh-water mouth mixed with the vast Pacific Ocean brine. The estuary’s expanse drew our attention through the blur of red alder, cottonwood and Pacific yew. There on the gentle water, we could envision Corps of Discovery members pulling hard on their canoe paddles, their eyes fixed on the broadening river that reached to the Pacific Ocean that rolled before them. They were at the threshold of attaining their goal at last. The enjoyment and rush of our motorcycle trip shared in the thrill and sense of adventure experienced by Lewis and Clark and the Corps of Discovery. Our trek on two wheels and paved roads would prove almost effortless compared to the challenges they had to overcome. They endured many hardships as they passed through this rugged and uncharted landscape over 200 years ago on flatboat, foot, canoe and horseback. 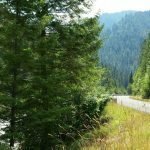 We fully realized we were not in the same league as Lewis and Clark, but we could imagine the excitement they experienced viewing the varied terrain as we traveled close to parts of their original route. In planning the trip, we knew we needed at least 12 days. We needed three days on I-90 from Wisconsin to western Montana and four days on the return trip on Interstate 80 from Winnemucca, Nevada, to our homes in southern Wisconsin. That left five days to tour the two-lane highways of western Montana, Idaho, Washington, Oregon and Nevada. Interstate travel days averaged 500 miles and touring days averaged 325 miles to be able to sightsee. Lewis and Clark officially started their trip on the Missouri River where it meets the Mississippi River in St. Louis. Gary and I started our journey in Wisconsin and crossed the Mississippi River at La Crosse. Lewis and Clark traveled a total of 28 months in their round trip journey, whereas we covered approximately the same distance in 12 days. Technology has changed also. Meriwether Lewis carried a thermometer, octant, sextant, spirit level, chronometer and a compass to record raw data and to chart and map this new land known only to Native Americans. Rivers, lakes, waterfalls, rolling hills and snowcapped mountains amazed their senses as they viewed them for the first time. Our technology included smartphones that supported real-time weather forecasts, a radar weather application that could follow storm fronts, satellite maps, instant communication and could answer any question we might have. I enjoyed my factory installed global positioning system (GPS) on my Gold Wing. GPS is useful to find a motel at the end of the day. I had all of our pre-booked motel stops entered into my GPS before we left home. Lewis and Clark had followed the Missouri River to its end at Three Forks in western Montana. We crossed the Missouri River at Chamberlain, South Dakota, and did not come across their path again until reaching western Montana. West of Billings, we could see the snow-peaked Beartooth Mountains to our south. The Absaroka Range adjoins the Beartooth Range and is home to Big Sky, Montana, along the Gallatin River. A road sign proclaimed, “Three Forks of the Missouri.” These were the final three branches of the Missouri that Lewis and Clark explored. According to Stephen Ambrose, in his book Undaunted Courage, “From the cliff Lewis stood on, the view today is still spectacular…aside from a few modern highway intrusions, the overall scene is as it was. There is a tremendous bowl, containing the linked valleys of the two rivers coming out of today’s Yellowstone Park to the south and east, and the valley of the river to the southwest…The rivers are crowded with fish and waterfowl; the banks are crowded with deer. The mountains surround the bowl in a nearly complete circle of up to a hundred miles in diameter and are just as Lewis saw them, lofty and snow-covered.” The three rivers are the Gallatin, Jefferson and Madison. They had now followed the Missouri River as far as they could. They had to seek another route west. It was inspiring to see this sight (Three Forks) and imagine the explorers at this spot just over 200 years ago. We continued on to Butte, Montana, where we spent the night. We left the interstate system and worked our way south and west along Big Hole River, east of the Pioneer Mountains. Threatening sky loomed ahead and ragged branch lightening flashed, so we put on our rain gear. We skirted the main part of the storm and only experienced a gentle, steady rain for about an hour. Chief Joseph Pass spiraled us down from 7,251 feet to Highway 93 that took us through the Bitterroot National Forest and paralleled the Bitterroot Mountains. 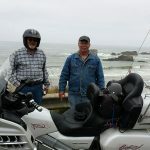 This is the path of Lewis and Clark, although they entered the valley further Gary Bornick and his 2008 Gold Wing by the Lochsa River in Idaho. Approximation of Gary Bornick and John McIntyre’s Lewis and Clark inspired trip. Snowcapped mountains were visible all along this stretch, but Bitterroot River Valley was built up and commercialized more than I had anticipated. 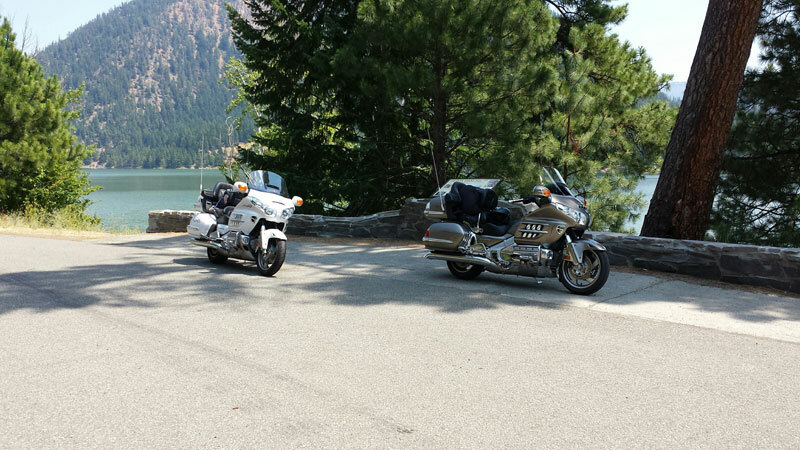 We continued north and turned on U.S. Highway 12 through Lolo Pass. This was the route west through the Bitterroot Mountains and was built in 1962. In Undaunted Courage you can also learn about the interesting set of circumstances that led the Corps of Discovery to take Lolo Pass. We headed into the pass and saw the sheer, steep escarpments that the Corps of Discovery had to traverse on foot leading pack horses. We followed the Lochsa River, pushing alternately on the left and right handle bar as we leaned the bikes to port and starboard through the twists and turns. Immersed in this rhythm of reverie, we felt glorious. This par ticular stretch in Idaho, from Lolo Pass to Lewiston, is the most pristine and undeveloped st retch left of the ent i re Lewis and Clark Trail. Highway 12 ribbons through the narrow canyon between forest and unspoiled river. It is a great motorcycle route. Once we entered the Bitterroots at Lolo, we were swallowed by Douglas fir, larch and lodgepole pine and lost sight of the higher elevation’s snowcaps. Lolo National Forest showed us a wide and varied spectrum with 17 conifer and five hardwood tree species. Proximity to the Lochsa River af fords some remarkable natural views that reveal the river alternately from slow moving, glass smooth cyan-blue water to a rough display of rocks and boulders that create the white froth of swift rapids. Many times we could hear the river churning without seeing it. The quiet, well-engineered, opposable six-cylinder Gold Wing engines allowed us to absorb the audible treat of fast water. According to journals and historical accounts, Lewis and Clark crossed through the Bitterroot Mountains and finally reached safety and food, courtesy of the Nez Perce Indians. It was a 160- mile trek in 11 days. They set out Sept. 5, 1805, and after the first day, it snowed. Not just a few inches, but several feet of snow fell for days and days. This made the narrow, sheer vertical-flanked trail harder to see and more treacherous. They carried little food and found the steep terrain and dense undergrowth made hunting nearly impossible. They were cold and hungry, but once they entered the pass, they had little choice but to continue. They were compelled to shoot several horses for food. It was one of the great forced marches in American history. In contrast, Gary and I crossed the Bitterroots in July during a heat wave. The high temperature for the day was 92 degrees. We had water and energy bars, and made it to our destination in Lewiston, Idaho, well within a day’s ride. We checked into our downtown hotel, with a restaurant within walking distance distance. After riding all day, it feels good to park the bike and walk. Af ter a good meal, our ritual is to soak a wash rag (we carry our own) in warm water to clear the windshield and do a once over with Original Bike Spirits Spray Cleaner and Polish to keep the cycles looking sharp. Lewiston is at the confluence of the Clearwater and Snake Rivers. Paper and timber products and agriculture are economic mainstays in the area. Tourism is also a big part of the economy, and Lewiston is a start off point for adventurers going down Snake River to Hell’s Canyon Recreation Area, a popular destination for camping, hiking, fishing, hunting and water sports. When touring on a motorcycle, it would be easy to get sidetracked and go exploring. 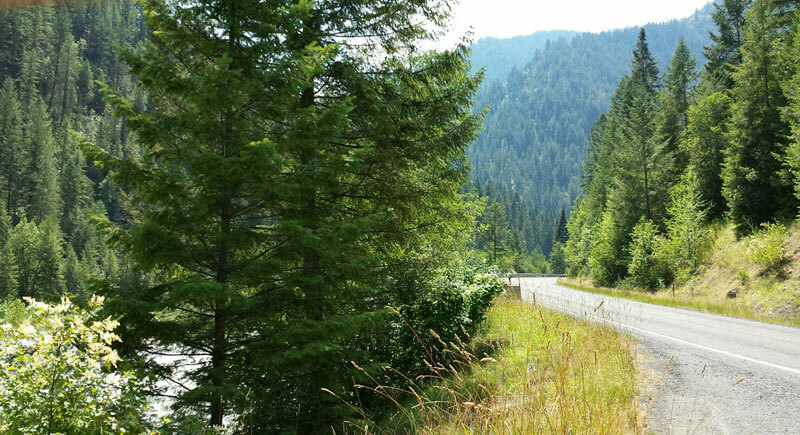 Our trip through Idaho along the Lochsa and Clearwater Rivers revealed a lush green, forested terrain. Lewiston was at the Washington state border and the topography, as we continued west, was radically different. Western Washington was arid with few or no trees and steep rolling hills. This was dry land wheat country. Some of the natural, sharp creases in the landforms were left untilled. As some of America’s Gary Bornick (front) and article author John McIntyre. We saw huge combines with hydraulic self-leveling capabilities, both side-to-side and front-to-back. Their super wide cutting heads were also self leveling and the machines would climb and descend the hills at 30-percent gradients. Miles and miles of wind-rippled wheat covered hills yielded to occasional fields of corn as the landscape gradually leveled. Then a field of potatoes would appear. As we neared Yakima River Valley, the landscape took on more green. The top three crops in Washington are apples, wheat and potatoes. We broke away from the Columbia River east of Walla Walla and followed U.S. 12 because we wanted to wheel off the Lewis and Clark route to visit Mount Rainier National Park. A benefit for us being 62, is we got a National Parks Senior Pass for a fee of $10. The day from Lewiston to Chehalis, Washington, was a shorter day with only 380 miles plus the side trip to Mount Rainier National Park. We entered at the Stevens Canyon entrance and followed the twisting road through hairpins flanked by tall white pine, Frazier fir and laurel. We continued to thread our way up in elevation and caught fleeting glimpses of the white domed monolith in front of us through the trees. The 47 extra miles through the park was taking us much longer than planned because of sharp curves and traffic. The temperature reached 94 degrees as the Northwest regional heat wave continued. Our watercooled GL1800s took the heat in stride. The cooling fan spun from time to time but the temperature gauge always held in the safe range. Having confidence in your machine means a lot when you are a long way from home. We drank water and hydrated regularly at pull-out stops where we enjoyed spectacular scenery. 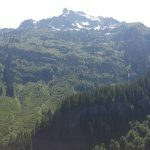 It seemed ironic for it to be so warm when we gazed at the southwest face of the mountain that featured the Cowlitz, Paradise, Nisqually and Wilson Glaciers. The Reflection Lakes looked cool and refreshing, as did Paradise River. 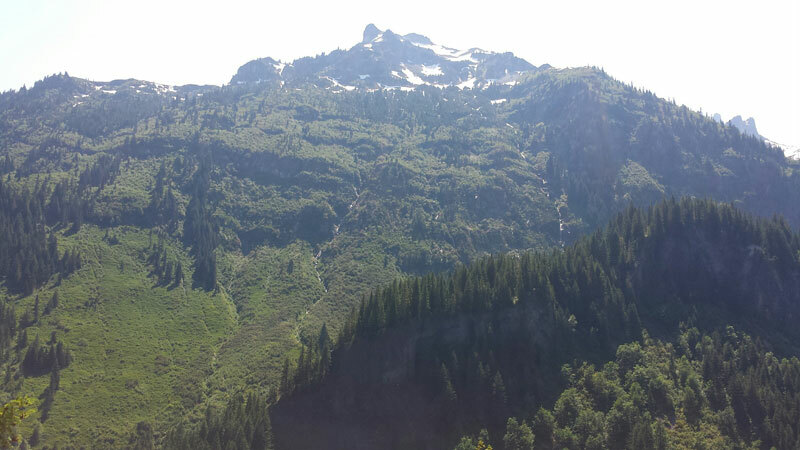 We crossed Paradise Valley and followed the river closely to where it joined the Nisqually River near the park exit. We wound our way back to U.S. 12 and picked up Interstate 5 to Chehalis, Washington. It was a Tuesday and we intentionally planned to miss heavier weekend traffic when we visited the park. The next morning, we headed south on I-5 and picked up State Highway 4 that followed the north bank of the Columbia River. This was the final leg of the explorers’ westward adventure. Lewis and Clark Interpretive Center and Cape Disappointment were at the end of the road at the Pacific Ocean. We backtracked a few miles and crossed the river on Astoria Bridge into Oregon. Our next stop, just south of Astoria, was Fort Clatsop, where the Corps of Discovery wintered from December 1805 to March 1806. After reaching the Pacific Ocean, they had to decide if they would return immediately or wait until spring. They decided to wait until spring because of the difficult crossing of the Bitterroot Mountains. Fort Clatsop is part of the Lewis and Clark National and Historic Parks and home to a replica of the original fort, as well as a museum. 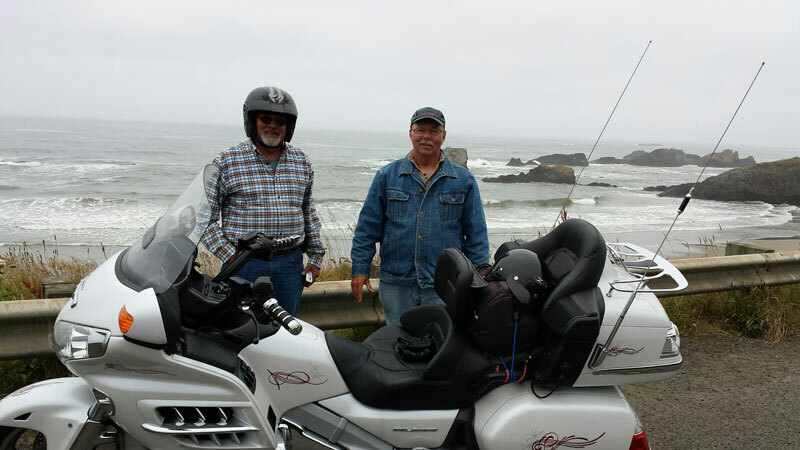 We left Lewis and Clark behind and toured south on the Pacific Coast Highway, Highway 101. Oregon would be the last state to complete my bucket list of being in all 50 states. 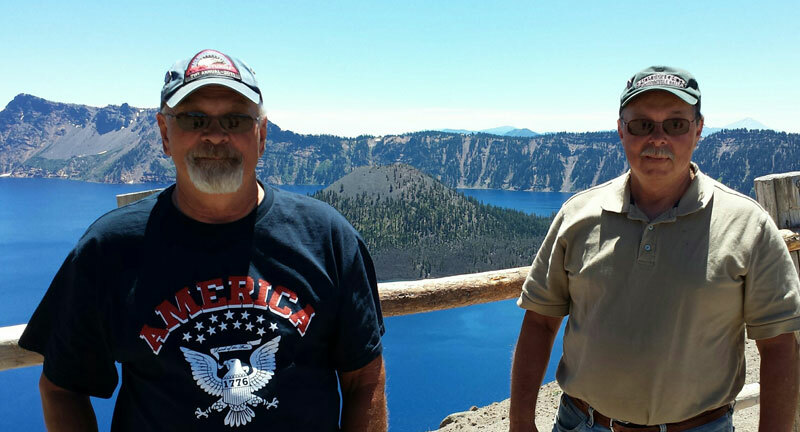 The end of our trip was nearing with just two more days of touring, including a visit to Crater Lake National Park, before we entered Nevada, and picked up Interstate 80 in Winnemucca. Gary and I covered 5,000 miles in 12 days in what proved to be a stimulating accomplishment. Lewis and Clark had traveled round trip from St. Louis in two years, four months. Their journey was more arduous and their goals were different. They did not find a northwest water passage, but charted and mapped a previously unknown frontier, befriended Native Americans, and recorded 178 new plants species and 122 new animal species. The only real discovery Gary and I made was finding a greater appreciation of their amazing quest. Posted 05/15/2016 by wing & filed under Featured, Road Trips. The enjoyment and rush of our motorcycle trip shared in the thrill and sense of adventure experienced by Lewis and Clark and the Corps of Discovery. Our trek on two wheels and paved roads would prove almost effortless compared to the challenges they had to overcome.